Hugo has a little bit of an underbite. It cracks me up sometimes when his teeth stick out. A face only a mother could love! He is super adorable, my rat terrier has a similar bite. Oh I think any dog mama could love that face! He's such a cutie. My pekingese has an underbite and his little teeth will stick out. Sometimes, his upper lip gets stuck and he will have this hilarious sneer on his face. Too cute! I wonder if dentists would recommend braces for this little guy. He looks so cute with that smile. I feel that under bite shows his swagger. My first impression was the head has no body attached to it. No worries, the underbite would not have any negative effect on his chewing abilities. He does look cute with that smile, but imagine that wolfish grin on people. I love Hugo. He's so cute. I love the expression on his face. I wonder what he is thinking of. It's great that he doesn't need denture repair, he's too cute! Looks like he'd still be as happy even when you get emergency dental care. Such a cutie. I think Hugo will still be very cute with or without his teeth. You are so lucky to own this adorable dog. Your dog looks so cute. I wish I had a dog like that. The teeth of this kind of dog are horrible. However, I have encountered and held a dog just like this and it was a very adorable one. I believe Hugo is an adorable dog as well. Doggie underbites just shows character on a doggie face. That natural look just screams cuteness at me. So cute! Any doggie underbite will really give a cute sneer to their faces. Hmm... 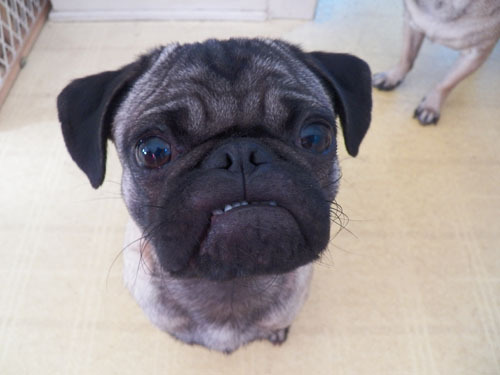 I wonder if there are specialist doggie dentists that can take a look at my pugs teeth. Underbites (for humans) can be addressed by a houston cosmetic dentistry practitioner. For doggies, it just adds to their cuteness so there's no reason to "fix" anything. I wish that dog could've shown his teeth a bit more. I could tell that he's got pearly white ones. I wonder if he goes to a dentist that specializes in teeth whitening in orange county. Really cute dog! I want to cuddle that cutie please! Great! usually posts some really exciting stuff like this.. Emergency Dental Care Houston Emergency Dental Care Houston, call 832-786-4406 we treat all of the emergency problem that one made have for Emergency Dental care Houston, We are the best. Hi, nice to see you, I am glad to help you, by the way, the dog is very cute except the teeth are not in a good condition, I guess that you maybe worried by this, no not worry, you know that in the market, there are many related dental equipment(Dental Implant Machine) which can help you to redress your dog’s teeth, alan dental can provide various dental equipment for you, trust me, besides, the after-service is good, have a nice day!! So the patient isn't given a halide treatment, however rather is shown the simplest brushing and flossing techniques in addition is suggested on the simplest diet which can guarantee healthy teeth and gums, for more information click here dentist boynton beach. Are these really effective? If so, thanks for sharing your teeth whitening regimen. I wish that dog could've shown his teeth a bit more. Great! usually posts some really exciting stuff like this.. Both parties have much to benefit from this partnership. It's not often that you associate racing with dental care.